Powdery mildew is a fungus that plagues almost all gardeners. 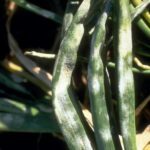 No matter what conditions you live in or how well you tend your garden, chances are you will come across powdery mildew at some point in time. Finding a cure for powdery mildew is something that all gardeners look for eventually. The first step in how to treat powdery mildew is to remove the conditions in which powdery mildew flourishes. Try to buy resistant plants – Some plants and varieties are more susceptible to powdery mildew than others. Look for varieties that are resistant to powdery mildew fungus. Plant susceptible plants in full sun – Full sun will help keep powdery mildew fungus off plants that are prone to the mildew. Water from below – Use drip lines or hoses to water your plants. Watering from above with sprinklers makes can encourage powdery mildew to grow. 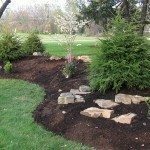 Increase air circulation – Try removing some of the vegetation on the plant to increase air flow around the plant. This will help keep powdery mildew at bay. Buy only high quality plants – Unhealthy plants are more susceptible to powdery mildew. Buy only healthy plants. 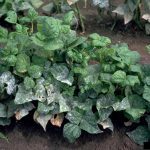 The above list will treat powdery mildew but not all are acceptable for plants you plant to eat. 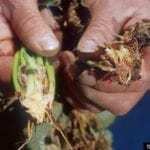 For example, Triforine should only be used on ornamental plants as it is not healthy for consumption. Check to make sure your treatment is a powdery mildew non toxic fungicide if you plan to use it on an edible plant. For a complete powdery mildew cure, combine addressing the conditions that cause powdery mildew and use the chemicals that are a cure for powdery mildew. This will take the powdery mildew out of your garden and keep it out for good.